Dec. 7. Bence Hoyle, the long-time Cornelius Police Chief, will step down Dec. 31. Major Kevin Black will become chief, according to a plan laid out over the past 18 months. “One of the most important responsibilities a Police Chief has is to develop its staff into strong leaders at every level of the organization. We have a very deep bench with several members of our command staff capable of serving as Police Chief anywhere in this state and many more who just need more leadership opportunities that will come with my departure. There is nothing more I can do to prepare my team to succeed,” Hoyle said. The Cornelius police department has been hurt by turnover and recruitments from departments in Huntersville and Charlotte. The average patrol officer stays less than two years in Cornelius. Hoyle is credited with such advancements as an integrated CCTV system that has directly solved a number of crimes. Hoyle, who served 10 years on the Board of Directors for the North Carolina Association of Chiefs of Police, also served on the Board of Directors for the North Carolina League of Municipalities, the only active Police Chief to do so. Black holds an associate degree from Mitchell Community College and a bachelor’s degree from Lees McRae College, came to Cornelius in 1993. He has since spent his entire law enforcement career serving the Town of Cornelius. He spent his first three years as a patrol officer before he was promoted to Sergeant. As Sergeant, he served for seven years supervising a patrol squad. In 2008, Black was promoted to Captain where he spent time leading the Field Operations Unit as well as the department’s Services Unit. 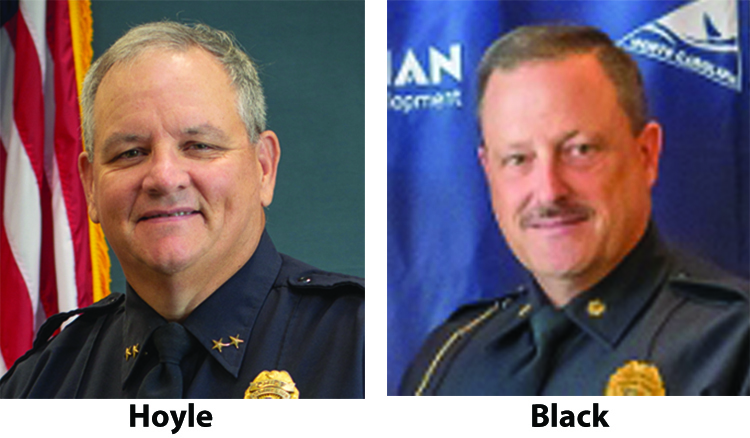 In 2012 Hoyle promoted Black to the role of Police Major. For the past six years Black has been serving as second in command, overseeing the daily operations of the department and its budget. “I have no doubt that Major Black will exhibit the leadership, integrity, and experience necessary for our Police Department to thrive during his tenure as Chief. He is a model citizen and I look forward to the great things he will do for our town. The citizens of Cornelius are in good hands,” Mayor Woody Washam said.